Santa, is that you?! We are loving today's cute scrapbook layout by Debbie Sherman! See the detailed photos below! I created this layout using the Cut n Boss and these fun pocket dies. I create the Rose I simply layered 5 of the large flower die cuts on top of each other alternating the petals and then curled the ends with a wooden skewer. I used the small flower die to create the inside layers of the rose bud. The leaves and small berry flourishes are cut from the pocket dies and are the perfect details to a flower cluster. Thanks Debbie! 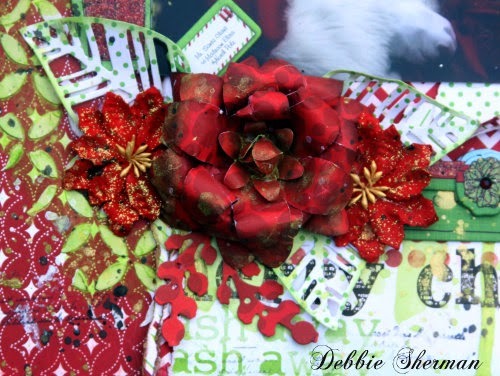 What do you think of Debbie's gorgeous layout?! Be sure to leave her a comment!